Multiple award-winning D-Rail was once again awarded for their groundbreaking infrastructure monitoring service. This time they won the digital award at the UIC Digital Conference 2018 in Paris on December 6th. The UIC Digital Awards seek to recognize the sharing knowledge between railway companies and start-ups. D-Rail was awarded the digital award 2018 for their innovative infrastructure monitoring service. – We are very happy for this award and the acknowledgement from UIC. 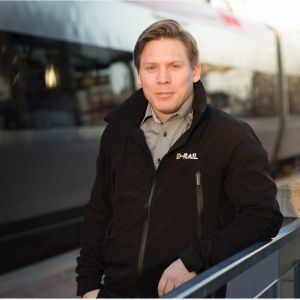 Hopefully this award will lead to interesting discussions with customers globally, customers that are ready to make railways safer, says Christoffer Hamin, founder and CEO at D-Rail. D-Rail offers complete monitoring solutions for tracks, overhead electric, balises, switches and wheels – on any railway network. The solution offers real time everyday condition information for predictive maintenance. – We have developed a very advanced and intelligent monitoring service that will launch on February 12th 2019. We are looking forward to sharing our service on the global market and to be a part of saving time, money and lives around the world, says Christoffer Hamin. At the awards, UIC – the worldwide railway organization – emphasized that the railway industry has to open up to start-ups and smaller players on the market to enable transformations through new innovative perspectives. The digital transformation with IoT (Internet of Things) and AI is the fourth paradigm shift for the railway industry. The ongoing mobility revolution is evolving rapidly; the railway industry should embrace the infinite possibilities coming with it.